Why is the largest mammal bigger than the largest fish? An interesting paper published in Reviews in Fish Biology and Fisheries back in 2002 looked at the question of “why are there no really big bony fishes?” In the paper, Jonathan Freedman and David Noakes at the University of Guelph in Canada looked at physiological, morphological and life history data for a variety of elasmobranchs (sharks and rays) and bony fishes. 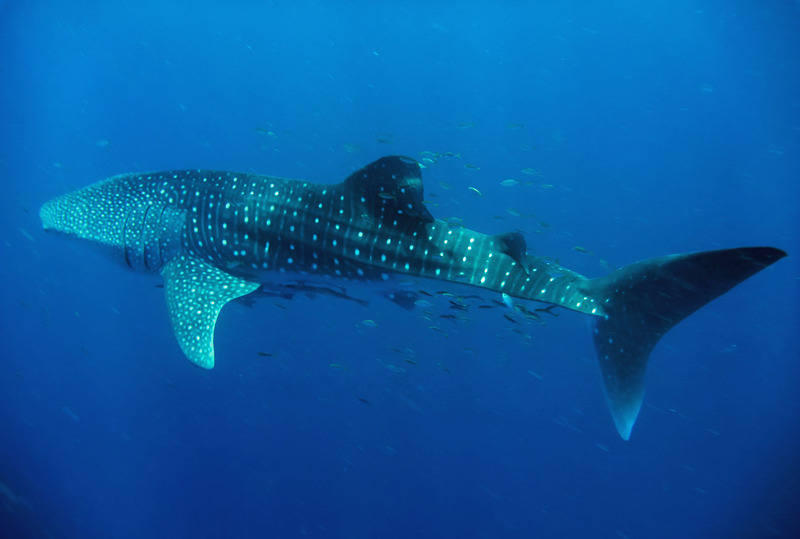 None of the hypotheses they investigated could, on their own at least, explain the fact that the largest cartilaginous fish species (the whale shark, Rhincodon typus) is significantly bigger than the largest bony fish (the sunfish, Mola mola). The physiologists concluded that the discrepancy in maximum sizes between these groups may lie in the smaller initial body size (a factor of oviparity) and slower growth rate (due to indirect development) of bony fishes compared to elasmobranchs. Now, although this doesn’t relate directly to our question, in the same paper Freedman and Noakes mention that gill size may represent a proximal limit to fish size. In other words, there is a maximum body size that can be reached with a given gill size. This is interesting because it intimates one of the possible reasons aquatic mammals can grow so much larger than fish. 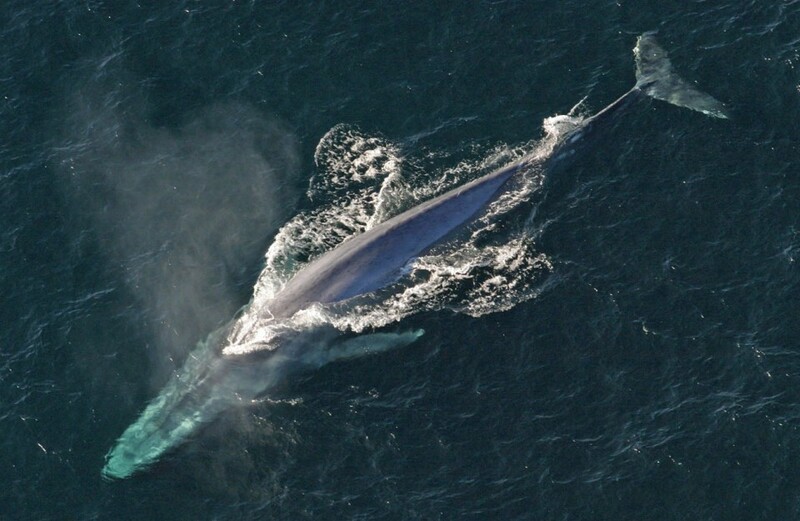 The largest living mammal species in the world is the blue whale (Balaenoptera musculus), reaching some 33.5 m (110 ft) and weighing a staggering 150 tonnes. Conversely, whale sharks attain a maximum length of about 21m (68 ft) and can weigh an impressive, but paltry by comparison, 36 tonnes or so. There have been several theories put forward to explain these differences, one of which revolves around one of the most fundamental gasses in the atmosphere: oxygen. In a fascinating communication to New Scientist in September 1997, M. Pannevis suggested that the discrepancy in size between these two species might be a result of the way in which each takes up oxygen. As Pannevis notes, seawater at 10-deg C (50-deg F), with oxygen saturation of 50% contains about 4ml of oxygen per litre; the oxygen content of water then decreases significantly with increasing temperature. The air directly above the water is at atmospheric pressure (i.e. 760 mm Hg), however, and contains about 21% oxygen, which translates to about 260ml of oxygen. The point to all of this is that whales (and mammals in general) have access to between 20 and 50 times more oxygen when breathing air than fish can extract from the water. Thus, oxygen probably represents a significant limiting factor to the growth of fish over mammals. Another theory proposes that heart design may be a limiting factor to overall body size. It has been suggested that the differences in circulatory ‘wiring’ and heart morphology between fish and mammals may restrict body size. The circulation found in fish is often referred to as “single”, because the blood travels a single circuit: from the heart, to the gills, to the body, and back to the heart. Mammals, on the other hand, have “double circulation”, whereby the blood travels through two consecutive circuits. First blood is pumped from the right-hand side of the heart to the lungs and then returns to the left-hand side of the heart (the pulmonary circuit), from where it travels around the body and back to the right-hand side of the heart (the systemic circuit). The benefit of this double circulation is that it allows blood to be pumped through the lungs at a low pressure (protecting their delicate capillaries) and then the re-oxygenated blood returns to the heart where it is pumped at high pressure through the veins and arteries, allowing oxygen and nutrients to be delivered to growing tissues more rapidly. Double circulation is possible because the mammalian heart is divided into two sealed sections along its vertical axis (each “chamber” is then divided horizontally into the ventricle and atrium); this prevents the oxygen-rich blood coming from the lungs mixing with the de-oxygenated blood returning from the body. In fish, however, blood pressure in the entire body must be low. Fish hearts aren’t divided into separately sealed ‘sides’ like the mammalian heart and if the blood left the heart at high pressure it would rupture the capillaries of the gills, killing the fish. Consequently, the blood leaves the heart at low pressure on its travels to the gills and then must continue to the rest of the body at the same pressure. Thus, the theory is that the larger the body size, the greater the pressure required to push the blood around the body – so fish, with their low blood pressure, are prevented from getting too big by their hearts. So, which is the correct theory? The short answer is that we don’t know. Both are sound theories but, in practice, it’s probably rather naive to assume that only one aspect is responsible. It seems probable that various factors, including how much oxygen the animals can obtain and how easily they can ‘upscale’ their circulation combine to control how big they can grow.